Social, cultural, natural, and spiritual capital are tightly intertwined. When we privatize cultural capital such as songs and images, we also destroy the social capital of the human relationships that create them, and erode the spiritual capital of individual creative capacity. Moreover, as music and images originate in nature's sounds, vibrational ratios, and electromagnetic spectra, they may be considered natural capital as well. To these four forms of non-money capital could be added many others. Aesthetic capital, for instance, would consist of the the unspoiled views, natural landscapes, and unbroken quiet that has nearly disappeared from most of the country. We rarely assign a financial value to such pleasures as a sky full of stars, or see it as a robbery when the lights of civilization blot out all but the thirty or forty brightest. Airlines do not understand what they are taking from the public when their jet trails mar every sky from here to Los Angeles. Power companies don't appreciate the tragedy of power lines across nearly every panorama. Most children these days have never experienced the stillness of nature. The beeps of construction vehicles backing up and the roar of motors are audible in every park and forest left standing in my own corner of suburbia. Add to all this the general uglification of the landscape that accompanies superhighways, industrial facilities, superstores, and strip malls, and we have lost a form of wealth so basic that we hardly ever realize it is missing: to open our eyes and look upon beauty. Increasingly, there is no longer anywhere to escape the separate human realm that we have created. Paradoxically, even as it drives the conversion of beauty into ugliness, money is increasingly required to purchase beauty: a corner of the world insulated from the ugliness without. Houses with a beautiful view command a premium on the real estate market. We pay top dollar for vacation getaways to remote locations. Unique, handcrafted items are more expensive than generic mass-produced ones. Aesthetic wealth, once free to all, is increasingly the exclusive province of the rich. Down the street the bulldozers crush shrubs and trees to put up a new supercenter. Over the hill, a new highway roars. Pavement, squares, and noise proliferate around me. Maybe when I get rich I can buy a house out in the country away from it all. A related form of wealth is a kind of mental silence whose commoditized form is called mindspace. Our attention is for sale, to advertisers and anybody else with a product or idea to sell. The result is a cluttering of the mental environment with an unremitting stream of commercial messages: on billboards, on buses, on invoices, before movies, at sports events. When I was a child, I don't remember seeing corporate logos at the ballpark or on the program of our local arts festival. Every patch of empty space and every second of empty time is ripe for conversion into money. I once read that advertisers can buy time on a special radio station that broadcasts commercials into the Lincoln Tunnel for the seven minutes or so of empty time when cars are out of reach of normal broadcasters. Today there is even talk of new sound technologies that will deliver location-specific messages to pedestrians as they walk past each store. A variant of social capital might be termed "civic capital". Civic capital is the generalized, culturally-transmitted participation in politics and government, including both the confidence and the political skills to participate effectively in democratic society. In his book Bowling Alone, political scientist Robert Putnam chronicles a generation-long decline in civic participation that has reduced democratic citizenship to a mere matter of voting—more "meaningless choices in a box." Few people these days participate meaningfully in local government as the community networks that once exercised political clout have evaporated along with other dimensions of community. Increasingly (though recently there are signs that this trend is reversing) we are content to choose among the options presented us from on high. Finally, we are losing what we might call physiological or health capital: the biological resources and abilities of the human body. It is evident that many of our human capacities have atrophied, to be supplemented with technology. For example, not only do most people not know how to procure food and shelter in nature, but many Americans over the age of fifty cannot survive without a variety of pharmaceutical medications. Nor are most women able to give birth to a child in the absence of technology. Soon they may need it even to conceive: infertility is a growing problem worldwide, and recent studies have confirmed an annual decrease of around 2% in sperm counts. The aids and comforts of technology have become props to survival on the biological level. Admittedly, most of the dependence is an illusion, a function of ignorance: in the case of pharmaceuticals, an ignorance of natural medicine and the maintenance of the body; in the case of childbirth, an institutional distrust of the woman's body and a taught fear that compels women to seek expert assistance. While the dependence on technology is not yet total, we are slowly but surely losing our abilities to walk, sleep, squat, sit cross-legged, run, defecate (why else so many laxative commercials on TV), and even to breath. Technology accomplishes for us the functions these abilities used to serve. In most cases, this dependency has not (yet) been integrated into our genes and is in principle reversible. Nonetheless, we have indeed sold, or at least mortgaged, much of our physical health to the demands of the money economy. My health is an asset, a resource that I can convert into money, for example by working overtime in an office or working in hazardous conditions. Remember the eternal business idea of taking something away from someone and then selling it back to them? Technological society, through its conveniences and demands, has taken away our health and now sells it back to us, for money, through the machinations of medicine, supplements, fitness centers, and so forth, all of which allow us to cope in today's world. The semblance of health they bestow is usually enough to get by in a technological society, where we rarely have to endure cold temperatures for a long time, or climb trees, or walk for ten miles, but it is a far lower level of health than a human living in nature enjoys. If current trends persist, the dependence on medical technology is likely to grow more and more acute, until we reach the science-fiction world where medical devices and other technology are incorporated into the human body from birth, or even before. Already there is talk about "designer babies" whose genes are artificially engineered or selected for specific traits. Already there are implants of computer chips and various timed-release drugs. And while the talk is of someday creating super-humans with vastly augmented mental and physical capacities, most of the applications so far are simply to help unhealthy people to cope, to get by. We are experiencing today an epidemic of mysterious new diseases, mostly malfunctions of the immune system. "Science is making progress toward a cure," we are told, but another way to look at it is that a (perhaps life-long) course of drug therapy, gene therapy, or whatever will effectively incorporate technology into bodies that are not viable without it. Since the diseases of the 21st century are, in the opinion of most alternative practitioners, caused by technology (environmental toxins, sedentary lifestyles, and industrial food processing, to name a few), our use of technological medicine indeed amounts to the buying back of what technology has taken away from us to begin with. In other words, we have converted our physiological or genetic capital into financial capital. We have sold away our health only to buy back an inferior version of it. Earlier I wrote, "What else do people still do for themselves?" What else could be converted into a "service"? What about body parts and functions? I am thinking here of the kidney industry, which induces poor people around the world to sell their own kidneys for transplants in the West. Another growth industry is the surrogate womb business, outsourced increasingly to Third World countries. From conception to gestation to birth, from nursing to day care to school, from little league to summer camp to electronic entertainment, the process of making a human being becomes, in the extreme, a series of services. Not too far, really, from the nightmares of Aldous Huxley. When we become aware of the magnitude of our destitution, we naturally desire to reclaim for ourselves some of that lost wealth. However, to reclaim our lost health and connectedness, stories and imagination, capacities and relationships is no trivial matter. Many of the old relationship-sustaining structures are broken, leaving us alone and helpless. We know not where to begin. Moreover, the monetization of life engenders a relentless insecurity and anxiety that bludgeons us into submission. When all our survival skills have been sold off we are left dependent on money—a supreme irony, given that people sacrifice life for money precisely for the stated purpose of achieving "financial security." Money, once incidental to survival (as in the case of the subsistence farmer) now becomes synonymous with the means to survive. A natural corollary of the conversion of the physical, social, and cultural world to property is that we must pay to live. Could this, and not a sinful human nature, be the reason for the anxiety and greed that so pervades our culture? Dependency on money, coupled with the ceaselessly intensifying competition it implies, means that it is not only difficult but also irrational to reclaim life for ourselves. The remote specialists and professionals who discharge our life functions do so much more efficiently than we can. To cook from scratch, garden, fix our own cars, play our own music and make our own clothes are economically inefficient activities that set us back in life's great competition. In economics, the very word "rational" means the maximization of one's financial interests—a very significant assumption. How much is your time worth? How many dollars per hour? Go ahead and calculate how much money you net by changing your own oil. (Include the "cost" of your own labor.) It is more rational to let the specialist do it. It is more rational to let the specialists at the supermarket bakery bake your son's birthday cake (the cake costs only $4 and it would take you more than an hour). It is more rational to let the specialists with their vast economies of scale cook all your food. It is more rational to let dedicated specialists clean your house and take care of your children. Time, after all, is money. The emptiness of this way of thinking is self-evident, for it reduces life to money (just as the phrase "Time is money" implies). Yet the reduction of life to money is exactly what is happening through the choices we make, or are compelled to make. It is exactly what is happening whenever technology makes our lives more convenient. The reduction of life to money is exactly what is happening through the vast conversion of all forms of social, spiritual, cultural, and natural capital into financial capital. The equation "Time is money" brings us to the heart of the matter. Having turned all the world and everything in it into property, we apply the same equation to time itself, subjecting our every interaction to the calculus of economic justification. In this saying is encoded nothing less than the complete monetization of human life. There is something monstrous about the very idea of a wage, the sale of one's time that is the sale of one's life. You sell the very hours of your life. Such a concept indeed sparked tremendous resistance during the early Industrial Revolution, before which, Kirkpatrick Sale writes, "Time was a medium, not a commodity." But as the routine, mechanical actions of the assembly line worker and industrial machine operator replaced the skills of the independent craftsperson, skills became increasingly superfluous until workers had naught to offer but their time. They resisted heroically this monetization of life itself, even when the alternative was utter destitution, and the question of how to instill and enforce "labor discipline" became a leading topic among intellectuals of the day. Unfortunately, self-evident as its emptiness may be, the reduction of life to money is written on a deep level into the assumptions of economics and the criteria for public policy. Its main conceptual justification originated in the philosophy of Jeremy Bentham, who thought that the duty of government should be to maximize total happiness. True to the Galilean tradition, he decided that the way to proceed would be to quantify goodness, or as he called it, "utility". Then it would be a simple matter to calculate the total utility resulting from Policy A, compare it to the total for Policy B, and choose the one generating the most "utils" of happiness. Now you'd think that to quantify happiness or goodness is a notion so absurd as to require no comment. I wish that were true! In fact, we have actually attempted to implement Bentham's suggestion, though in a disguised form. Instead of the "util", we denominate the good in dollars. Economics asserts that we are rational actors—"economic man"—seeking to maximize a self-interest—personal good—measured in dollars. The good of the nation, too, finds expression in dollars whenever we assume that economic growth is a positive good. Economic growth is defined in terms of gross domestic product—the total value of all "goods" and services measured in dollars. Another significant quantification of goodness is embodied in cost-benefit analysis, which assumes that all relevant costs and benefits can be assigned a monetary value. In so doing, it is often necessary to assign a value even to human life. Is it worth it to spend a billion dollars on safety equipment that will save ten lives? How much money is a human life worth? How much is your life worth? The monstrous implications of this way of thinking—a literal reduction of life to money—are clear. Ethicists tie themselves into knots over this issue, but no satisfactory solution is possible as long as we continue to quantify the good. Yet some economists seem to think that this quantification has not gone far enough. Exemplified by Gary Becker, they proclaim that an economic calculus governs all human interactions, from crime to marriage to the pursuit of education. Becker, who won the Nobel prize for "having extended the domain of microeconomic analysis to a wide range of human behavior and interaction, including nonmarket behavior," advocates extending market mechanisms into these remaining nonmarket realms. Ah, if only the monetization of life could be completed, then life would be perfectly rational, perfectly efficient. The use of the word "goods" to denote the salable products of human activity reveals some very deep assumptions. First, harking back to agriculture, it suggests that goodness comes from human manipulation of nature and not from nature itself. A good is something produced, extracted from its original place in the ground, the water, or the forest and then subjected to other forms of processing. Unimproved, nature is not good. Oil in the ground or a forest left standing are invisible to economic accounting: they are not yet "goods", just as unpaid mothering is not yet a "service". A second implication is that if something is good, it can be assigned a price—commoditized, bought, and sold. Got that? Our definition of a "good" is that it is exchanged for money. Money = Good. That some good things are not yet commodities merely means that the conversion of social, cultural, spiritual, and natural capital is not yet complete—good news for anyone but an economist. From the economist's point of view, the equation of economic growth with more and more "goods" adds a note of moral imperative to the quest for economic growth. More and more goodness, more and more happiness. 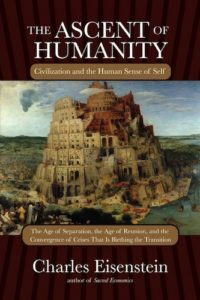 The ascent of humanity. "To cry enough or to call a limit was treason. Happiness and expanding production were one." After some years of controversy, the phenomenon of falling sperm counts was confirmed by a massive meta-study led by Shanna Swan of California's Department of Health Services ("Sperm Count Decline Confirmed" by Magie Fox, Reuters, November 24, 1997). No one agrees on the reason, but I think the main culprits are toxic estrogen-mimicking chemicals like PCBs, excessive soy in the diet, hormones in industrial meat animals, and tight underpants. Just kidding about the last one. See for example, "India's New Outsourcing Business – Wombs", by Sudha Ramachandran. The Asia Times, June 16, 2006. These were the official words of the Nobel Foundation when it issued Becker's prize in 1992. For more details see, http://nobelprize.org/economics/laureates/1992/press.html. To see the hyper-rationalism and abstraction of this approach, see Gary Becker and Judge Richard Posner's blog, http://www.becker-posner-blog.com.